Dormitory-style housing in a corridor style building. Guests will share bathrooms with other conference participants. You may explore different residences here. Which residence hall the confernce participants will be housed in is currently not specified. Rooms are available for reservation from Sunday, July 10 to Friday, July 15, 2016. The housing rate for the 5 nights of the conference is $425.00 plus tax per person. UPDATE on April 13, 2016: Additional rooms were added and reservation deadline is extended until June 10, 2016, or until rooms last. 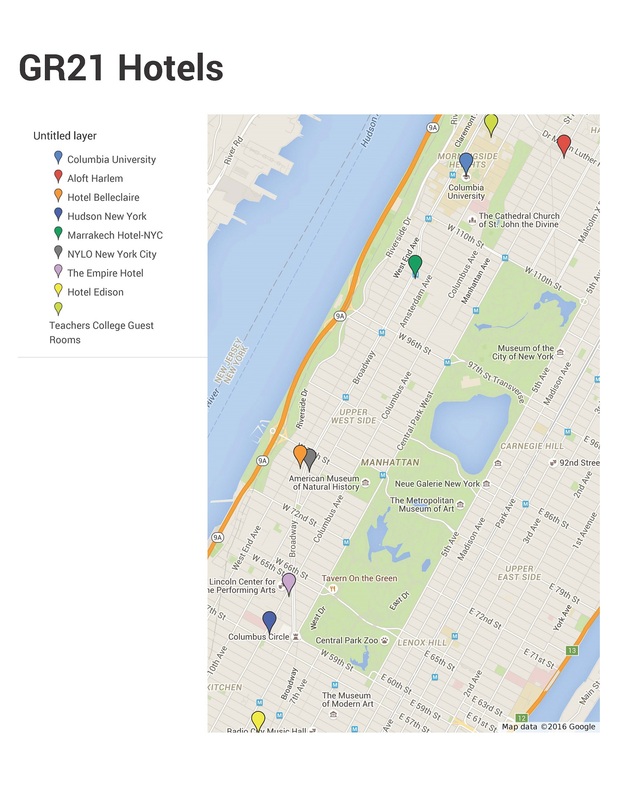 The Towers is located in upper Manhattan on the campus of the City College (map) in approximately 20 minutes walking distance from Columbia campus. City College is two subway stops uptown from Columbia. It is also accessible by the M11 bus line running along Amsterdam Avenue right by the Columbia campus. City College runs a shuttle between the 125th st A,C,B,D subway station and its sampus. This shuttle stops at the Towers and is free to use by those who stay at the dorms. You may explore the Towers here. Rooms are available for reservation from Sunday, July 10 to Friday, July 15, 2016 (checkout). The single occupancy housing rate for the 5 nights of the conference is $360.00. All rooms that are available for our conference attendees are single occupance in 4 bedroom/2bath units. The accomodation reservation can be accessed via this link. The hotels in the table below are holding rooms for our conference for July 10(check-in)-15(checkout). -At each of the hotels below, a limited number of rooms may be available for the night of July 9th for guest who wish to arrive early. -Additionally, at each of the hotels below a good portion of the rooms may be booked for the night of July 15th as well, for guests who wish to stay an extra night. Please inquire at the reservation phone number provided for the hotel of your choice if you would like to extend your stay beyond the nights of July 9-15. Roooms may be available, but may not offer the conference rate. Please make sure that you understand the hotel's cancellation policy for your reservation before making your choice. Click here for hotel map. Update on June 10th: Some hotels below extended their cutoff day slightly beyond the original cutoff of June 10th, please see below which are those. You may need to call to receive the rate if the hotel's website is not updated with this new information. The rates do not include tax and fees. *Run of the house rate, may be single or double room. **Group name at each of these hotels is '21st International Conference on General Relativity and Gravitation'. If a separate group code is available it is provided in the table above. Please contact the hotels directly at the above numbers of you have any questions. These rooms are available only for July 11(check-in) - July 15 (check-out). The total rate is $532 for the 4 nights. Total ten rooms are being held by the conference organizers until 6/10/16. ***Please send an email request to GR21.LOC@gmail.com with suject heading 'TC accommodation request' to get the rooms released for you***. The plenary talk abstract booklet is now available. July 13, Wednesday 7PM, Hall of the Universe at the American Museum of Natural History. Please go to Registration to purchase dinner ticket.